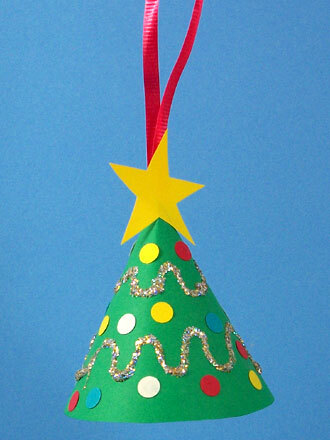 A simple cone of paper can be made into an ornament that everyone will enjoy. With just a few standard supplies, you and your children can make and decorate these miniature Christmas tree ornaments. 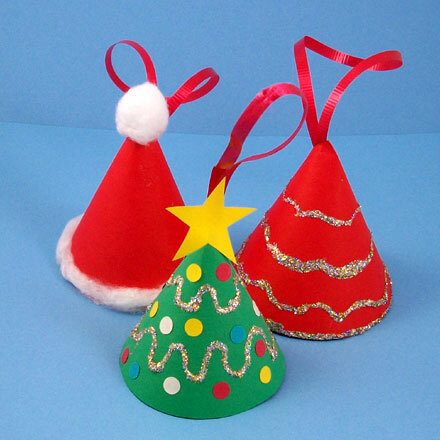 You can also make Santa's hat and bell ornaments using the same cone-shape. This project is perfect for family, classroom or group craft time. It requires just a few materials and offers endless possibilities for individual creativity. This project also goes along with math lessons to reinforce the concepts of circles, semicircles, and cones. 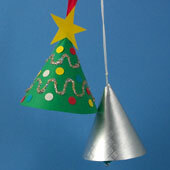 Read through the project and gather the materials needed for making the Conical Tree Ornament. If you are doing this craft with a group, precutting 5"-to-6" semicircles from green construction paper will make the craft go faster. Draw a 5"-to-6" circle on green construction paper. You can use a compass to draw the circle, or trace around a small plate or lid that is 5" to 6" across. Cut out the circle. Fold the circle in half and unfold. Cut on the fold to make two semicircles. Make a pinch fold in the center of the semicircle's straight edge. This is the top of the cone. Form the semicircle into a cone by bringing the two halves of the straight edge together. Overlap the edges and glue them to make a cone. This is your little tree to decorate. Use the hole punch to punch circles from several colors of paper. Glue the circles to the tree as ornaments. You will need about 20 circles for each little tree. Tip: If you don’t have a hole punch, cut small circles, squares or triangles with your scissors. Make them about ¼" in size. Cut a small star out of yellow construction paper. Glue it to the top of the tree. Let the glue dry before going on to the next step. 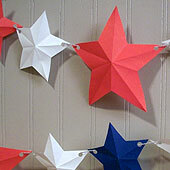 Tip: See Aunt Annie's Star Garland project for instructions on cutting a perfect five-pointed star. You could cut a star from white paper to use as a pattern, and then trace it onto yellow construction paper. 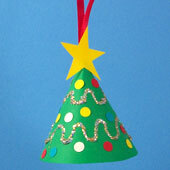 Draw two garlands (squiggly lines) around the tree with a small bead of glue or a glitter pen. Dust the glue with glitter. Decorate the star with glitter, too. Tip: Add a special touch by writing the year or a name in glitter. Cut a 10" length of narrow ribbon. Glue or tape the two ends to the back of the tree. After the glue has dried, your ornament is ready to hang on the tree. Tip: To hide the ribbon ends, slip the ends through the top of the cone's seam and tape them to the inside of the cone. That's it! Now it's time to hang your ornament! 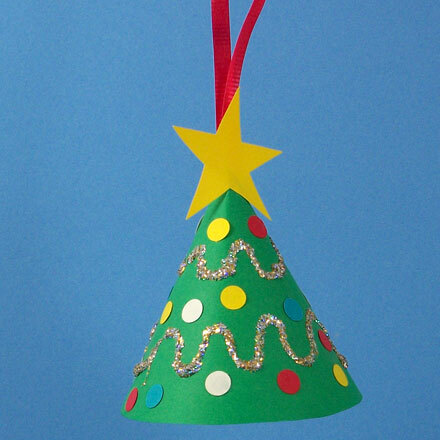 Tip: You can make other ornaments with this simple cone shape by changing the colors and decorations. 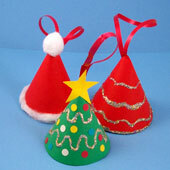 Make a Santa hat with a red cone and glue on bits of cotton balls for the white furry trim and tassel. You are only limited by your imagination! 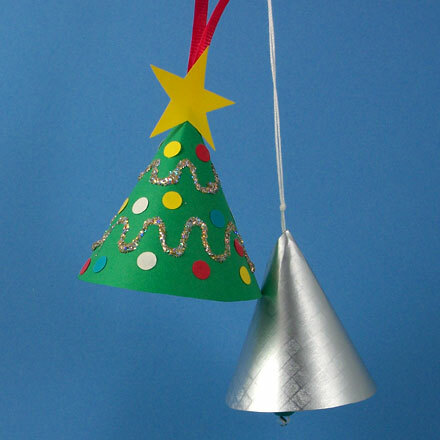 Tip: Make a bell ornament with silver or gold paper and a bead clapper. You could also trim the bell with fancy ribbon. Tip: See Aunt Annie's Star Garland project for instructions on cutting a perfect five-pointed star for the top of the mini-tree ornament. You could also make a garland of stars for your family's Christmas tree!